There are a myriad of choices available in this day-and-age when it comes to pizza. When you come right down to it, however, there is nothing quite like homemade! This is a white-sauce variety, which is a bit nontraditional, but becoming more popular. The ingredients are vibrant colored, fragrant, and the taste of these mingled together is spectacular. I would highly recommend making your own homemade pizza dough. While it requires a bit of advanced preparation, the crust is really the key to great pizza. Hint: This pizza dough recipe will make enough for one large pizza or two small ones. I will often make up a batch of dough, and only use half. The other half can immediately go into the refrigerator until the next day. Place it in a zip-lock bag and pit into cold storage before it has a chance to rise. The next day, simply toss the bag on the warm counter to rise for a few hours. Wash the artichoke hearts, mushrooms, and basil leaves. Cut the artichokes in half. Cut the mushrooms in thick slices, about 3-4 slices per mushroom if large, or cut them in half if they are small. Carefully, inspect the basil, remove the stems, and cut into long, thin strips. Dice the garlic. Slice the cheese into about a dozen slabs. Add a bit of olive oil to a pan and bring up to high heat. Sauté the garlic for 1 minute. Add the mushrooms, and continue for about three more minutes, stirring constantly. Add the sun-dried tomatoes, artichokes, heavy cream, a pinch or two of dry chicken base, and fresh ground pepper to taste. When the sauce starts to bubble, reduce to low heat and simmer for about five minutes. Remove the pan from the heat. Hint: The sauce should be thick and have very little liquid remaining. If too much remains, your crust will turn soggy. If necessary, continue to simmer on low until the sauce thickens. Sprinkle a bit of flower on a flat surface. Add the now-risen pizza dough. Sprinkle more flower over the dough. There are a couple ways you can handle the dough, and both will yield different results in your pizza (try them both!). You can hand-press the dough by simply working the dough with your fingers to press it flat. Begin in the center, and carefully make your way out to the edges. Press it as thin as it will allow without tearing. Hand-pressing can lead to a fantastic chewy crust. If you prefer a thinner crust, use a roller and roll it as thin as you can. Don’t worry about making a perfect circle. It actually adds to the presentation if your pizza turns out to be irregularly shaped, making it look more homemade and authentic. Using a roller will generally allow for a slightly larger pizza. I would recommend a pizza stone if you have one. Otherwise, use a piece of tin foil over a cookie sheet. Sprinkle corn meal or a bit of flour on the stone or sheet. Carefully, add your dough. Pour the sauce in the center of the crust. Use a spoon to cover the dough evenly, leaving about an inch of crust around the edge. Distribute the slabs of fresh mozzarella evenly on top of the sauce. Finish by sprinkling the with our strips of fresh basil, adding the great color, fragrance, and presentation to your pizza masterpiece. Bake at 400 degrees for 18-20 minutes. 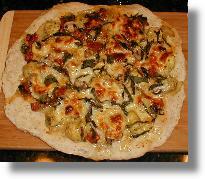 Carefully use a spatula to remove the pizza from the pizza stone or tin foil and move it to a wood cutting board. Let it rest for about three minutes before cutting and serving. It might seem weird but I never had artichokes before, this seems like a good way to try them. I tried your pizza sauce and it was really good. I had it with some pasta though. Next time I’m making the pizza !